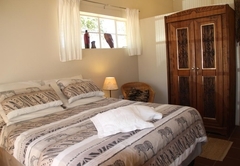 Dreamcatcher is a highly recommended B&B with self catering option, providing accommodation in Tulbagh for tourists visiting the Cape Winelands region. 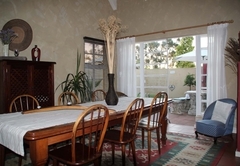 If you are looking for very private Bed & Breakfast or Self Catering accommodation in the Cape, about an hour and a half drive out of Cape Town, The Dreamcatcher is a wonderful retreat. 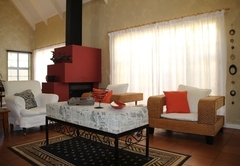 You will enjoy an extremely tranquil stay, away from the hustle and bustle of the City. 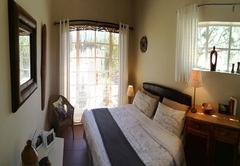 Dreamcatcher is situated 0.5 km from the historic town of Tulbagh (Church street) and only a 50 m walk to leading restaurants. 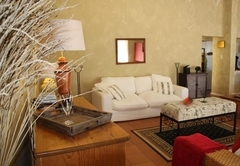 Enjoy the peaceful country atmosphere! 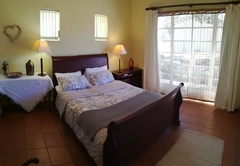 Dreamcatcher has 3 double bedrooms and 3 bathrooms (2 en-suite) and is available for a minimum of 2 persons and a maximum of 6 persons. 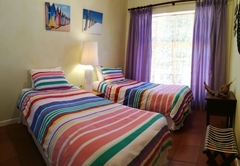 The bedrooms are beautifully furnished and are all air-conditioned. 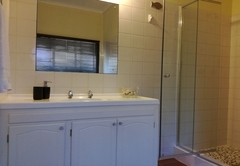 The bathrooms are spacious, modern with all the best fittings. 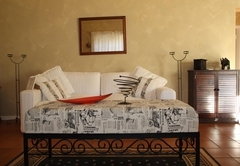 The finer touches such as the complimentary toiletries and beautifully presented towels, sea shell arrangements and candles do a lot to make you feel very pampered and welcome in this house. 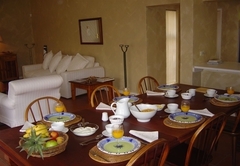 The kitchen, lounge and dining room area is open plan - with a high, arched ceiling the area is large, light and airy, beautifully furnished but still very comfortable. 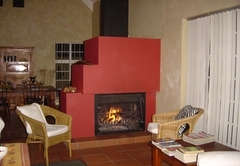 For cooler evenings there is a large fireplace to keep you warm whilst you watch Television (with M-Net) or enjoy some of the fine Cape wines you've purchased from any one of the nearby Wine Estates during the day. 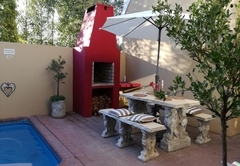 The dining / lounge area has two sets of large double doors that lead out onto an enclosed patio with swimming pool, outdoor seating area and a braai area (barbecue). 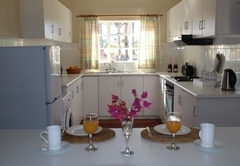 The kitchen is well equipped with oven and hob, microwave, large refrigerator and everything you would need to cater for a sit down dinner for 8 guests. 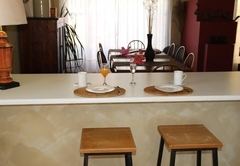 The dining room table seats 8 very comfortably if you decide to dine indoors rather than enjoy the outdoor barbecue area. 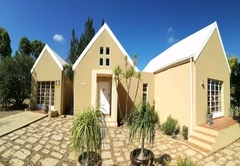 Dreamcatcher sleeps up to 6 people, but whether you rent one, two or three bedrooms, the whole house is at all times exclusively yours! 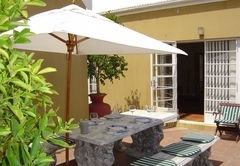 Tulbagh is a charming historic town with a wealth of Cape Dutch Architecture. 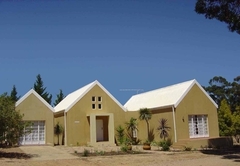 Set in a beautiful landscape, Tulbagh is famous for its heritage, magnificent country living, scenic beauty and majestic mountain ranges. 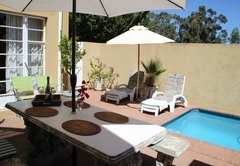 In more recent times, wine has moved centre stage and visitors to the valley can now enjoy a wide range of wines from the various estates and private cellars. 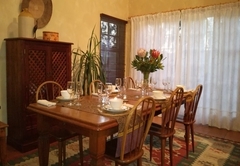 Wines that have received a string of national and international awards including Diners Club Wine Maker of the Year, a healthy spread of gold and double gold Veritas awards, and numerous others. 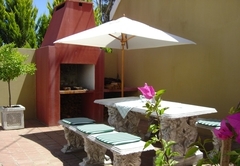 Tulbagh boasts many recommended fine restaurants providing both local and international cuisine. 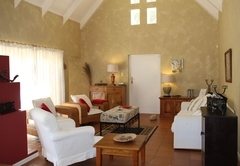 This large self-catering house has three en-suite double rooms. 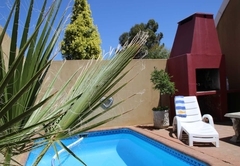 The house boasts a fully equipped kitchen, a living room, a dining room and a private terrace with a swimming pool and braai area. 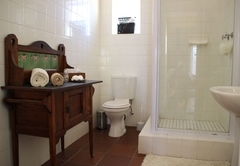 The house is air-conditioned and has a bath and a shower. Response timeDreamcatcher typically responds to requests in 5-10 minutes.